Does a delivery of kittens sound absolutely wonderful? Does a delivery of kittens sound absolutely wonderful? If you live in Georgetown, DC, it’s a possibility, thanks to the cat cafe, Crumbs & Whiskers. 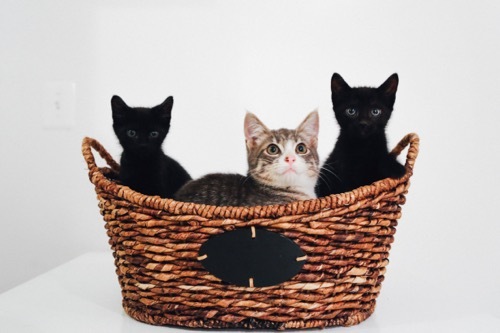 Cat fanatics can sign up to have a basket of three to five kittens, plus macarons, delivered to their homes on December 20th. For $100, you can spend half an hour with the kittens. Crumbs & Whiskers is DC’s first cat cafe. Owner Kanchan Singh has hosted successful kitten parties at the cafe, and notes that many people enjoy giving kitten parties to a loved one as a surprise. But the element of surprise is detracted a bit because the gift recipient has to travel to the cafe. With kitten deliveries, much more of that surprise can be left intact. All of the kittens delivered will be available for adoption through the Lost Dog & Cat Rescue Foundation. Anyone interested in adopting a kitten may submit an adoption application. It takes about 24 hours for an adoption to be approved and processed, meaning that the kittens could potentially have new homes for Christmas. Kitten deliveries will be very limited, so if you’re interested, then make sure that you sign up right away on the Crumbs & Whiskers website – the signup will be available in December. And if you’re not able to participate in a kitten delivery, then think about heading down to your local shelter to check out the kittens in need of homes. At first I thought this sounded like a terrible idea. Where are all these kitten coming from, I thought? And what happens when they lose their kittenish cuteness? But then I read on to find it was more like a little adoption party and I thought, what a great idea! Instead of the immediate excitement of having a kitten in your hands at an adoption place everybody can chill in their own home with a selection of kitties and decide upon the one or two that really make their mark on the family. DO you have any idea how this experiment went and if it is likely to become a regular thing?